All presentations have some emphasis on plants - with a special emphasis on our native indigenous plants. Plants are more than just something to adorn our landscapes. Plants, specifically native plants, are critical to the health of our ecosystems. All animals (insects, butterflies, birds, mammals) are directly or indirectly dependent on plants. Without the milkweeds there would be no monarchs. Without our insect pollinated plants there would no pollinators. Our birds depend on the insects that eat plants. Plants form the bottom of the food chain on which everything else depends. That said there are many native plants that make our lives better directly. There are many plants we can harvest for food. We can use the fiber from plants for cordage or making paper. And so many of our native plants are incredibly unique and beautiful. Native plants are important to us and all life. What are native plants and why should they be used in your landscape? 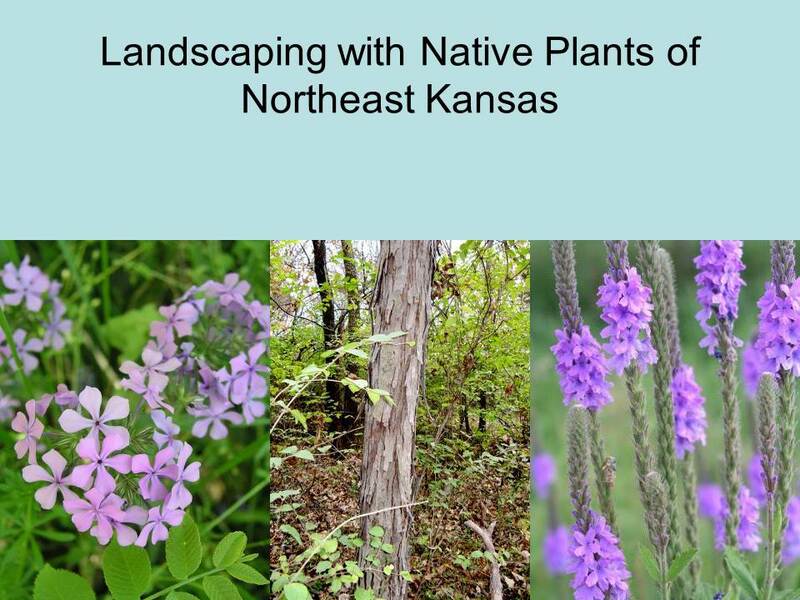 In this presentation you will learn about the variety of native plants that you can use in your landscape. A variety of trees and shrubs are discussed that define structure in your landscape. A special emphasis is placed on plants for specific sites. The prairie plants that are ideal for full sun are covered as well as woodland plants that require partial sun and shade are described. Water gardens and rock gardens are also covered. Learn about the variety of wildlife such as butterflies and birds that will be attracted to your native plant landscape. You will walk away with a better understanding of our native plants and their importance to sustaining life in our gardens. 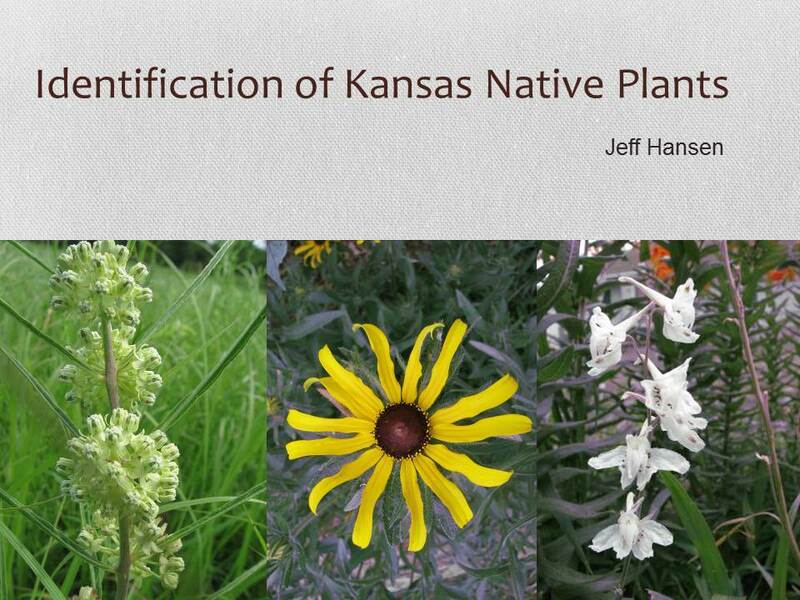 With over 2000 plants found in Kansas, how can you learn to identify any plant with so many possibilities. In this presentation you will learn about the different categories of plants and identify them based on all of their characteristics. You will learn about our primitive plants that reproduce by spores as well as more evolved plants that reproduce by seed. We will examine woody plants such as trees and shrubs as well as grass-like plants like grasses and sedges. The broad-leaf plants (forbs) give us our many showy wildflowers. Expect to leave with a better understanding of the great diversity of plants native to Kansas as well as a methodology for identifying plants. Attracting birds involves much more than putting up a bird feeder. In this presentation you will learn to provide the four things birds need to survive and prosper: food, water, shelter, and nesting sites. All are important to attracting birds to your property. You will learn the importance of native plants and the kinds of plants that provide a variety of habitats for birds. A variety of feeders and food are described along with methods of providing water. We will also cover natural and artificial nesting options that are critical to the well being of our birds. A favorite part of the presentation are videos of backyard birds feeding, nest building and fledging from the nest. 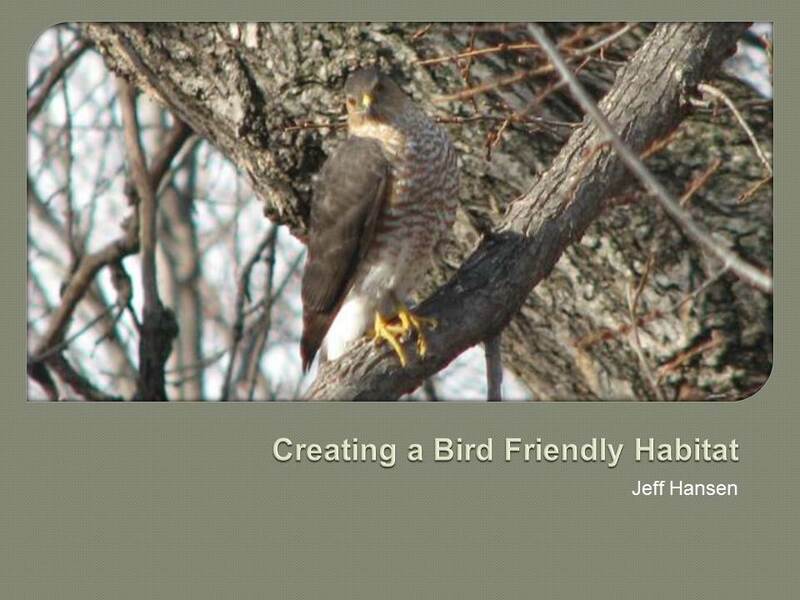 You are sure to learn how to make your yard a much better place for birds. The plants we have in our landscapes have a direct impact on the natural world around us. All animals are directly or indirectly dependent on plants. Learn about the plants that various species of butterflies need for survival. See the birds that directly depend on the many insects that use our native plants for survival. This presentation explains how the food chain really works. You will learn about the plants that provide food for the insects, that provide food for other insects and birds. Learn that many plants can't exist without pollinators and pollinators cannot exist without those plants. You will also learn how the plants often used in our landscapes are native to other continents provide little if any benefits to life and often are destroying habitat when they escape from our gardens. 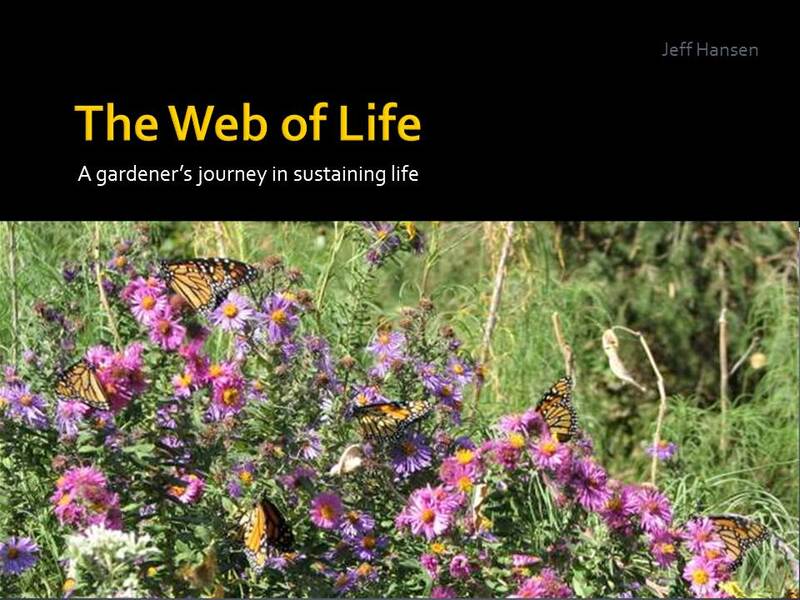 This presentation explains the many important interactions in nature that can take place right in your garden when you provide the proper plants. This is your chance to be part of the solution rather than part of the problem. If you are a gardener you have probably encountered many a plant that showed up in your garden but you weren't sure of its identity. You probably called it a weed. To some a weed is a plant growing where it is not wanted. With that definition any plant can be a weed. Instead we will focus on annual plants that prefer disturbed soil - like in a garden. In comparison perennial invasive plants will also be discussed. You will learn techniques for identifying those ubiquitous weedy plants. The instructor will bring fresh specimens of plants for hands on learning. 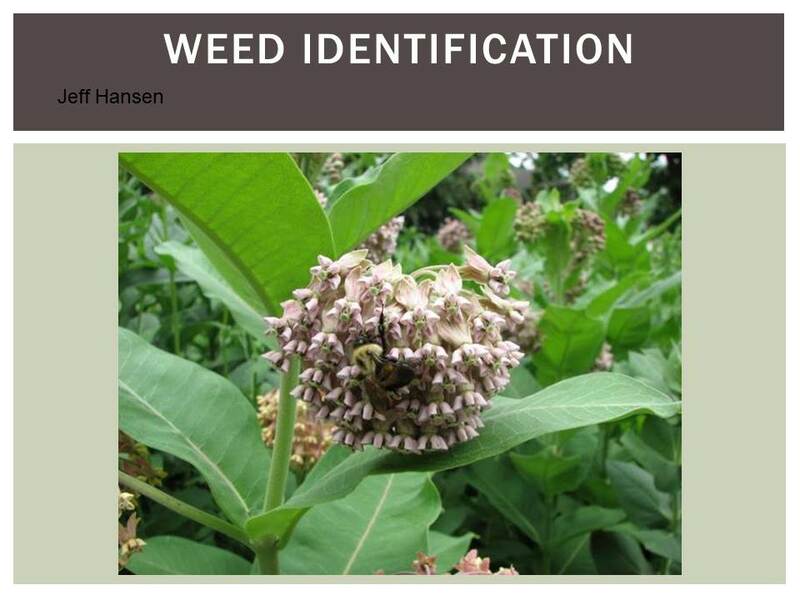 Attendees are encouraged to bring their own "weeds" to be identified. If you bring plants be sure to bring the whole plant (roots, stem, and leaves). To keep them fresh, place them in a plastic bag and store in the refrigerator. The best part of this presentation is seeing all the mystery plants in person and learning their identification. Did you know that paper can be made out of some of our most common native plants? Cottonwood, mulberry, milkweed, cattails, and grasses all can be processed into paper. The bast (stem fiber) as well as seed and leaf fiber can be turned into beautiful paper. Each plant fiber makes a paper with its own unique texture and color. Learn about some of the plants that grow here in Kansas and can be turned into paper. Learn how the different fibers are extracted from the plants and processed into incredible paper. Over 20 kinds of paper will be on display for you to see and touch. It is imperative that you handle the paper to truly appreciate it. 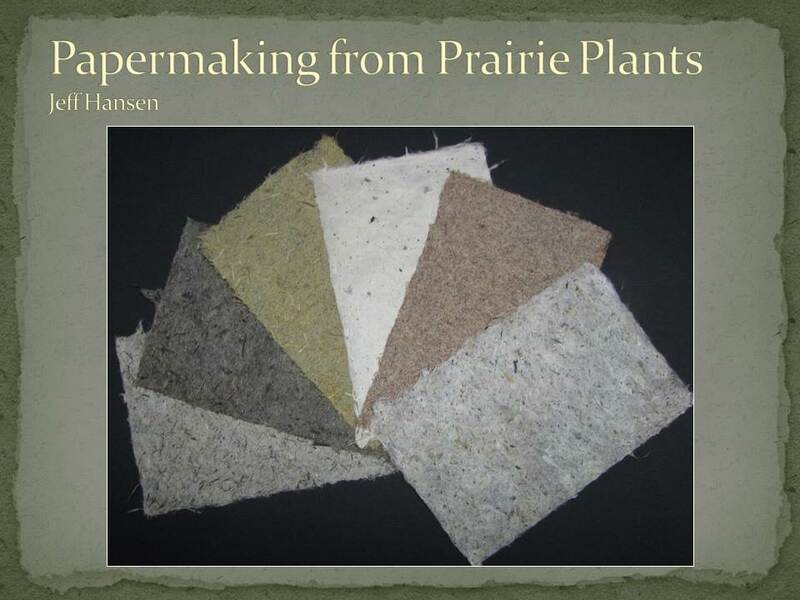 Maybe you will decide to try making paper from the plants after seeing the presentation. Presentation includes the following information. Different garden habitat types. Such as prairie (sun), woodland (shade), rock (dry), and water (wet) gardens. The following is provide by myself when making a presentation. The following is provided by you when making a presentation. What does it cost for a presentation? Contact me to set up an appointment or if you have questions.